Thread: Palit GeForce GTX 780 Super JetStream is monster! Its a monster of a card. 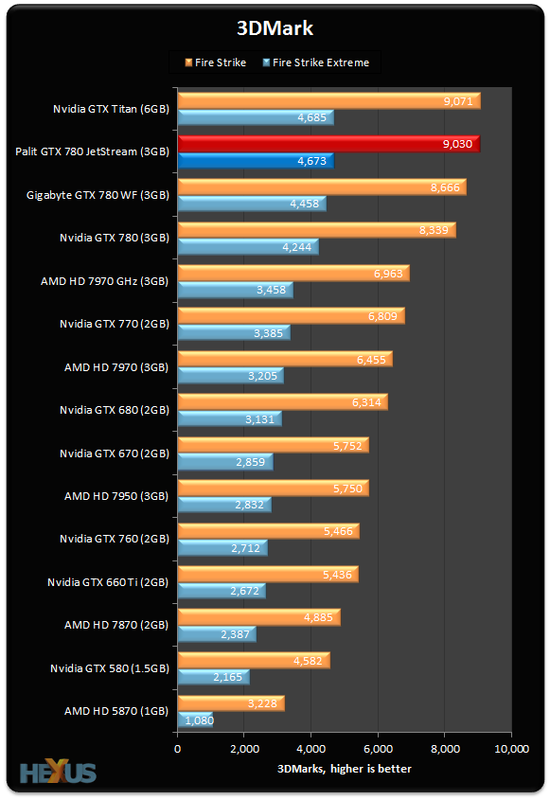 Beating the Titan in almost every benchmark. Half the price too! The core-rampaging Palit Super JetStream card matches a GTX Titan, and it beats the reference and factory-overclocked Gigabyte GTX 780 cards easily. Pushing the clocks as far as any GTX 780, Palit's beastie muscles past the Titan. It's also 20 per cent quicker than the poor-boosting reference GTX 780 model. The numbers also show the Palit is only card to manage an average 60fps at 2,560x1,600. 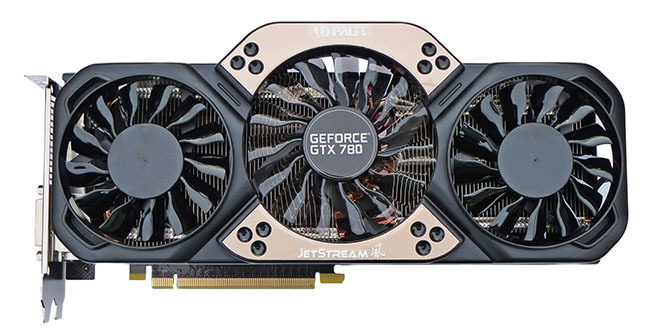 Re: Palit GeForce GTX 780 Super JetStream is monster! Sure it's legal. Dunno why it wouldn't be. This is however, an average 780, with no special innovations. Once you throw away the cooler, it's just a matter of clockspeeds, and virtually any card will do for that. The Hexus review states that the only thing Palit did to the PCB, was move stuff around (a whole half-inch) for better cooling. So, while it looks good, it just isn't anything special. This is however, an average 780, with no special innovations. Once you throw away the cooler, it's just a matter of clock speeds, and virtually any card will do for that. The Hexus review states that the only thing Palit did to the PCB, was move stuff around (a whole half-inch) for better cooling. So, while it looks good, it just isn't anything special. Palit added 8 phases instead of the standard 6 on other 780s. 8+6 pin pcie power instead of 6+6. Better cooling. A better board then the others. It is something special when compared to the other 780s on the market. It comes down to clock speeds only if the card you are comparing it to can handle the higher clocks on gpu core and memory while being stable and not overheating. A single gpu card that is substantially less beating the Titan out of the box is kind of special. So if you continue to OC this card it will beat it by an even larger margin. To answer the legality question. Yes. Credit was given to the source along with a link. It was not posted as something created by PureOC or one of its members. No trademarks were removed of violated. The standard nVidia GTX 780 uses a 6+2 power phase, and an 8+6 pin power connection. What are you on about? It's a factory OC, which means it isn't special "out of the box". Overheating is a non-issue to someone who's going to throw the cooler away. So everyone watercools and tosses the stock cooler? Only that matters? You may not see anything special and that is your opinion. Others who may be considering buying a 780 may see differently. You are missing the point. The point is that card doesnt cost $1000 and has yet the same or better performance. 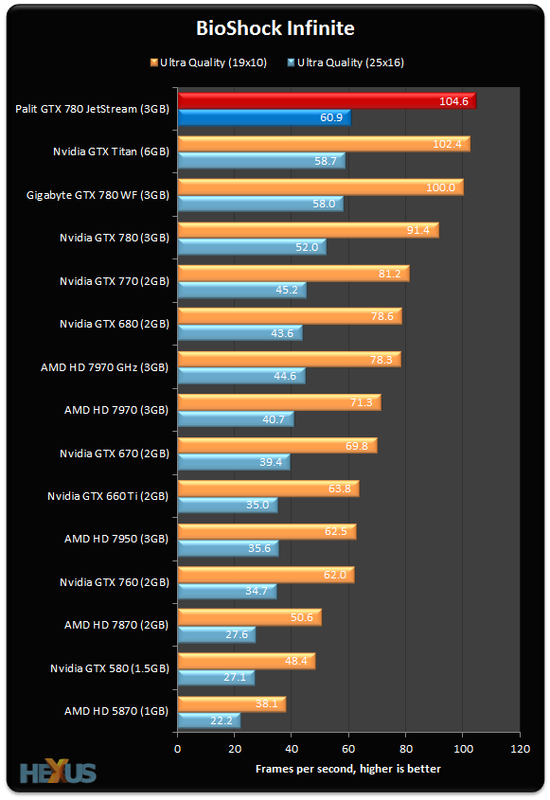 It is also within the same price range of the other 780s and again offers better performance out of the box. Not all of the 780s will be able to achieve the same overclocking performance as this one. I am by no means a Nvdia fan boy but I can recognize a good product when I see one. I'm not missing the point; you are. I said, "Once you throw away the cooler, it's just a matter of clockspeeds, and virtually any card will do for that." Meaning, the cooler is the only thing that sets this card apart from the other 12 companies offering a factory OC'd 780 (and the 20 companies offering OEM). You're arguing for a point I already made. You know what, nevermind. You're probably right. Last edited by Earthmonger; 05-07-2013 at 23:14.
so does it mean that Palit GTX 780 Super Jet Stream is the best GTX 780 version all around? i do agreed with the bench result and technology, nonetheless the cooler looks smoking hot! Wow! That looks like an epic card.